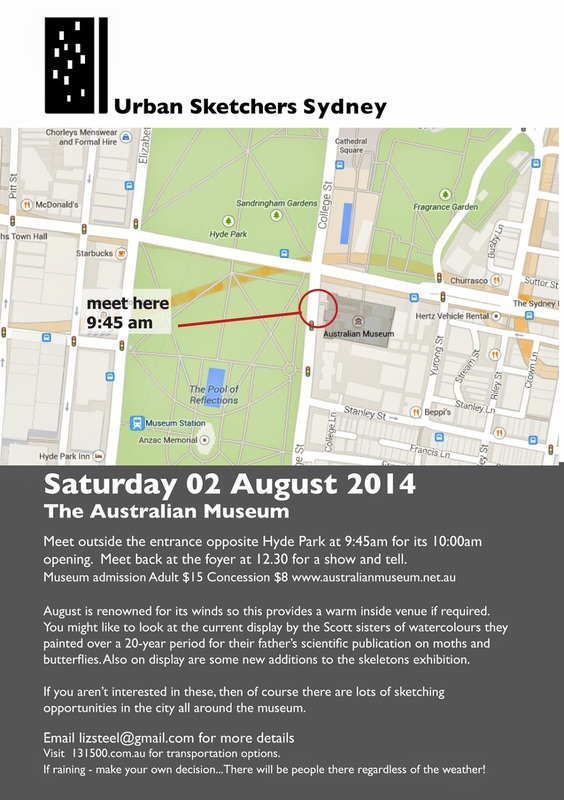 Our next get together will be at the Australian Museum on Saturday 2 August. Meet outside the entrance opposite Hyde Park at 9:45 for its 10:00am opening. August is renowned for its winds so this provides a warm inside venue if required. You might like to look at the current display by the Scott sisters of watercolours they painted over a 20-year period for their father’s scientific publication on moths and butterflies. Also on display are some new additions to the skeletons exhibition. If you aren’t interested in these, then of course there are lots of sketching opportunities in the city all around the museum.